Want to download Seventh Son movie for free? What is this movie all about? How do people think of the Seventh Son movie? And how to free download Seventh Son Movie? You will get enligtened by 5Kplayer together with some knowledge concerning the film provided by this article. 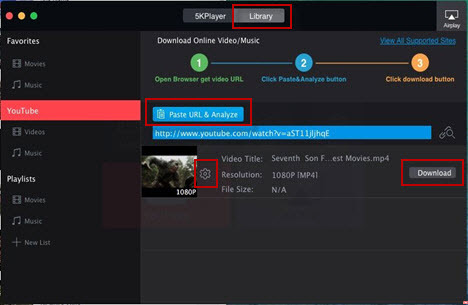 You need 5KPlayer to assist you in fulfilling the download Seventh Son full movie, since this robust video downloader is capable of downloading almost all videos of various formats from YouTube and other over 300 online websites including VEVO, Vimeo, facebook, etc. Seventh Son is an American fantasy film based on the novel The Last Apprentice (titled The Last Apprentice: Revenge of the Witch in America). The film was first released in France and Lebanon in December 2014, and then opened in other 24 new markets, including Russia and Spain, gaining $19.6 million box office in total up to now. In America, the Seventh Son trailers have been spreading around for a while; but, to watch Seventh Son full movie in theater, you may have to wait until early Feb. Then, how to take a beforehand peep at it? 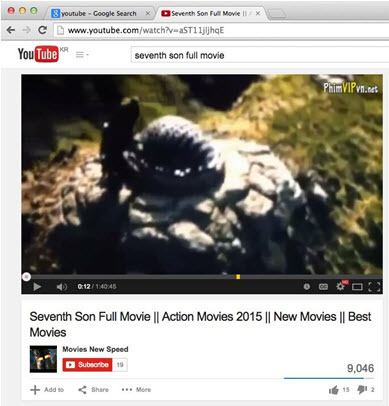 What we found is that you can free download Seventh Son movie from YouTube already! The trailers of Seventh Son on YouTube have really turned us on, yet, the sad fact is that the viewers' rating and feedback of its movie is comparatively low, with a rating of merely 6.1 and 6.4 on Imdb and Solar respectively, as most viewers were disappointed in its lack of depth and tired plot, slow and predictable. If you want to watch a fantacy and a movie starring Kit Harington in particular, Seventh Son would be a good choice to kill time during the wait for Game of Thrones next season (free download GoT 5/6). But if you want to watch some high quality fantacy movies or historical disaster romance movie, Hobbit 3 and Pompeii (Kit Harington) can be even better choices. Anyways, you can free download Seventh Son movie from YouTube to fill up a dull day or know more about Kit. 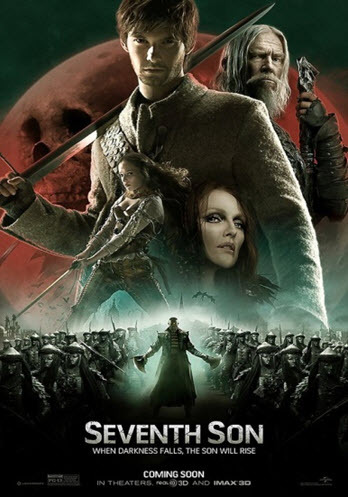 To free download Seventh Son movie, you may first think of finding the Seventh Son on torrent players like Popcorn media player or other torrent sites like Pirate Bay; but downloading the film is quite another thing since some movies are unable to download and some can bring malware. Instead of installing a YouTube downloader and being on the go finding a suitable player for required video formats, you can kill two birds with one stone by making full use of the 5KPlayer, which is one of the best free HD player that delivers high quality playback of 4K/5K videos. It can not only play videos, music, DVDs, radios but also enable you to download YouTube videos or music. It supports almost all known video formats such as YouTube (FLV/MP4/Webm), SD/HD/4K Videos, AVCHD Video (*.mts, *.m2ts), H.264/MPEG-4 AVC (*.mp4), MPEG2 HD Video (*.mpg; *.mpeg), MPEG-4 TS HD Video (*.ts), AVI, MPEG, WMV, MP4, FLV, F4V, H.264/MPEG-4, etc, and its concise interface makes it surprisingly easy to operate. Step 1: Download and run this top free Seventh Son download tool. Click "YouTube" red icon on the main interface. Note: Make sure that the URL is correct. Step 4: After the analyzing process, click Download button to download Seventh Son full movie. Note: If you want to convert the Seventh Son on YouTube to other formats, click the setting icon to choose the target format and the whole task will be done in a few seconds. 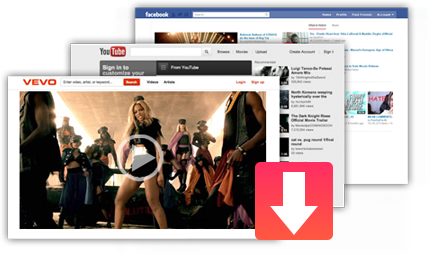 5KPlayer not only works with free Seventh Son download mission, but also music download and other movies, video clips download from over 300 online websites including Vimeo, VEVO, Facebook, etc. 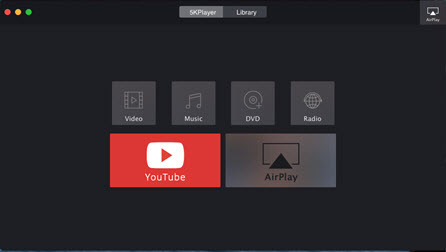 What's more, it, as a powerful online multimedia player, is capable of playing videos in any format and resolution(HD, 4K, 5K included) and is able to AirPlay downloaded videos, movies, music to Apple TV/ipad/Mac and other AirPlay supported applications with wonderful visual and audio experience.